I have always fantasized about working at some hip, outdoor market and last week my dream came true. A friend of a friend of a friend (thanks for the hookup, Alexis!) 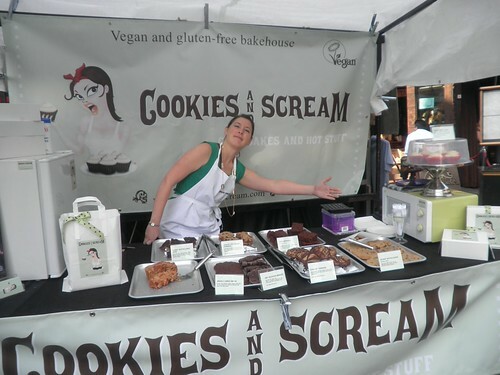 recently opened a vegan/gluten-free baked good stand at the famous Camden Town Market and I’m helping her while her regular employees are at a punk festival in Belgium. I’m definitely not cool enough to be working at Cookies and Scream or in this market, but I am able to move product–I sold out of everything but peanut butter bars on Friday! I’m pretty exhausted by the end of the day, but it’s an interesting temp job and her cookies and cakes are amazing–and this is coming from a person who is usually way more into savory treats. I’m pretty sure you will see these desserts in the supermarket one day, at least in Whole Foods. I’ll be back at the stand on Monday–come visit!